Before the FIRE Gold Update – Is $1,237 the new $720? Gold is insurance that protects wealth against errant central banking policy orthodoxy and debt-inflation government economic policy that are the hallmarks of the FIRE Economy. The rising gold price represents an increase in the FIRE insurance premium. In 2001 when we bought gold at $270 per ounce as wealth insurance against FIRE, it was cheap. Yet 99 out of 100 investors were then afraid to buy it. At the rate we’re going, in two or three years most investors will be afraid not to own it, and the FIRE insurance premium will far higher than the four times greater price of $1,220 per ounce that new buyers must pay today. Governments around the world stagger under the weight of public debts incurred to bail out economies from the FIRE Economy collapse of 2008 and 2009, which credit bubble bailed the economy out of the economic crash produced by the collapsing stock market bubble in 2001. The gold price rose every year for the past nine. This year is no exception as one sovereign debt crisis after another ratchets public debt commitments higher and higher. Investors from all walks of life in ever-greater numbers seek to protect themselves against the next FIRE Economy crash and the subsequent reflation. Did that sound like a cheesy late night TV ad for gold? Regrettably, our foreign, fiscal, energy, and monetary polices are a cheesy late night TV ad for gold. Our original 2001 argument for buying gold: financial bubbles end in severe macro-economy contractions, macro-economy contractions lead governments to reflate with debt issuance and low interest rates, debt issuance and low interest rates result in higher debt loads relative to economic output, a high debt-to-output ratio reduces sovereign creditworthiness, lower creditworthiness reduces currency exchange rate value, and reduced currency value increases the nominal gold price. Why gold and not other commodities? Because gold is the only commodity that central banks own. Why do central banks own gold even though currencies have not been backed by gold since 1971? Because central banks need to hedge the structural risks inherent in the politically unstable debt-based money system they oversee. They keep gold as insurance against possible—we’d say, likely—geopolitical accidents that could throw the system into chaos. As of 2001, the probability of an accident increased dramatically when the U.S. FIRE Economy suffered its first major shock since its formation the early 1980s. We joined the central banks then, adding a 15% gold FIRE insurance position to our own portfolio. That was nine years ago. Since then, an additional factor favoring gold as wealth insurance came into play that we were not aware of at the time: Peak Cheap Oil. On a global scale, [oil] prices increased 234% from the 2002 recession low of $27 average annual to $91 average annual in 2008. We expect a series of similar increases to occur in each Peak Cheap Oil Cycle. The next cycle may take oil to approximately $160 between 2011 and 2012, declining to approximately $80 in the recession that follows, based on calculations we did late 2008. 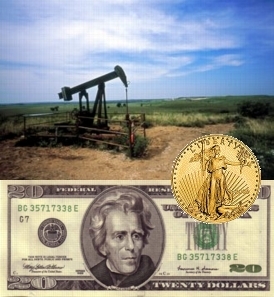 Rising oil prices influence on the price of gold both directly and indirectly. An example of a direct influence is cost-push inflation from rising input prices to food production. That will increase inflation in some areas of the economy, which will be reflected in the gold price. This leads to a multitude of indirect influences of oil on gold prices. Food price inflation, a regressive tax, will in turn raise government compensatory expenditures on government assistance programs, such as food stamps. Peak Cheap Oil and government spending on defense go hand in hand. The year that Peak Cheap Oil began in 2001 is also the year that the Iraq War commenced and has, with the Afghanistan War, added $3.3 trillion to the U.S. fiscal imbalance since. Increased outlays will occur at the same time as high energy costs slow the economy, reducing tax receipts. We estimate net government saving at -21% during the next recession, up from -9% during the 2009 recession and -4% in 2003 recession. Bottom line: High oil prices mean higher government deficits and a weaker dollar, which will also be reflected in the gold price. 2006 Gold update: What gold bubble? We have witnessed to rise of gold from $270 to a recent new nominal high of $1,246. All along the way, we have heard repeated claims that gold was a “bubble” or otherwise over-priced. The loudest protests came in 2006 when gold reached $720. We, however, have maintained our 2001 forecast that gold prices are likely to peak in this geopolitical structural Great Shift in the range of $2500 to $5000. We have not once in nine years sold any gold. We do not trade in and out of rallies, although we have identified corrections for those of our members who feel compelled to trade (See Gold Update: The small trade within the big trade). Trading gold is inconsistent with the concept of gold as insurance. We do occasionally trade our bullionvault account for the purpose of confirming or contradicting on the impact of sentiment and events on short-term gold price movements. We don’t publish the results of these trades because the idea of trading gold confuses the main point: we own gold as FIRE insurance against events that have not yet occurred. Further, our four-year record of gold trades is roughly 50%, netting close to zero net of taxes and transaction costs—just like everyone else. We've heard this question regularly since 2001, when gold traded at $400, $600, $800, $1000 and expect we'll keep hearing it asked for the next several years. The question is itself problematic. Buying gold is not like buy stock in Apple Computer, or even like buying a commodity like oil or copper. A rising stock price reflects the improving earnings prospects of a firm. A rising commodity price reflects either declining commodity supply relative to demand, or declining demand for the currency in which that commodity is traded relative to the supply of that currency, or both. Gold is more complex because it additionally acts as a currency itself (See The Fourth Currency) because it is the only commodity held by central banks. For this reason gold acts as wealth insurance, specifically hedging the impact of excessive government indebtedness on the purchasing power of financial assets. The question “Is it too late to buy gold” is like asking whether it’s too late to insure one’s home against fire. Before the FIRE, no. If you have fire insurance on your home, you’d only cancel that insurance policy if you were sure that the chances of a fire had disappeared. You might reduce our coverage if you thought the risk of fire had decreased. You might increase your coverage if you thought the opposite. We increased our gold position from 15% to 30% of our portfolio in early 2009 in response to the increase in FIRE risks as indicated by the execution of bank and financial system bailouts that more than doubled the Fed’s balance sheet. The fact that the FIRE insurance premium has gone up four fold in nine years is a reflection of the popularity of the insurance, which may or may not indicate an increase in the risk of FIRE, but certainly the more widespread perception of risks. This explains the recent gold price increases as stock and oil prices have fallen. More investors have come to the realization that they need the kind of wealth insurance that gold provides, while stocks continue to reflect a myriad of financial risks. Gold is acting as the recipient of flight capital from government debt and currency policies globally. The ratio of the DJIA to the gold price is barometer of long-term structural economic change and a market sentiment indicator. The price of the DJIA index tends over decades to move from a high to a low ratio as changes in the economy and markets push stock prices in one direction and gold prices in the other. The Great Inflation of the 1970s produced the previous peak in gold and bottom in stocks. The August 13, 1979 Business Week article The Death of Equities marked the bottom for stock market sentiment. Market sentiment reaches extremes of “Stocks are Dead” at low DJIA/Gold ratios and “Gold is Dead” at high ratios. Our original August 2001 DJIA/Gold chart shows that the ratio peaked about a year before stocks peaked. In August 2001 stock prices were considerably down, as forecast in March 2000, but gold prices had not yet started to rise; we waited until mi-2001 to get in. Our indicator was the Fed’s expression of worries about deflation, a consistent indicator of an intention to vastly expand the money supply. That was our signal to buy. While we continue to expect to see the gold price peak and stock prices trough at a DJIA/Gold ratio between 2:1 and 1:1, with gold trading between $2500 and $5000 and the DJIA trading around 5000 as originally forecast in 2001, a view re-affirmed in our 2008 update, our 2010 update reflects two changes. One, the peak in gold and trough in stocks is likely to occur sooner than 2018 as we forecast in 2008, reflecting the expectation of an 18 year period for stocks to reach “Stocks are Dead” sentiment extremes. We now believe that process will be shortened to 14 years and end around 2014 due to the combined impact of the Great Shift, described below. Two, given that the nominal price of the DJIA has remained higher than we expected, rising nominally 20% while falling 20% in real terms since the year 2000 peak as a result of the form of reflation policies, the lower DJIA ratio will likely be reached more by gold prices rising than by stock prices falling. A ratio of 2:1, and with it a peak in negative sentiment about stocks, may be reached with the DJIA continuing to trade in the 10,000 range while gold prices rise to $5,000. If this appears inconceivable to readers, we recommend going back to read our original 2001 forecast for gold at $2,500 when gold was trading at 1/10 of that price and try to imagine how that forecast appeared at the time. Today a $2,500 price is only slightly more than twice today’s price, and gold at $5000 is only four times the current price, the difference between the price when we bought gold and the actual price today. When will iTulip sell gold? We will no longer own gold when the economic and market conditions that led us to buy gold in 2001 no longer hold, the coast is clear, and the form of wealth insurance that gold offers is no longer needed: when (central banks divest), the Peak Cheap Oil Cycle is over, and the dollar has been subsumed into a multi-lateral currency system. The challenge will be selling gold at the right time during these processes and long before they are over. For a sense of the time scale, consider that six years of background work went into the policies of the Volcker Fed before they were executed on starting in 1979. A change government policy to restructure (write off) debt rather than buy private debt with public debt, and old public debt with new public debt, and in the process further expanding total debt and worsening the ratio of debt to economic surplus. The write-off is most likely to happen by a combination of inflation and restructuring. The end of the Peak Cheap Oil Cycle as indicated by the widespread substitution of diesel hybrid and liquid petroleum gas (LPG) powered autos for gasoline-powered autos. The end of the Dollar Cartel as indicated by the adoption of federated European and Asian currencies backed by pan-European and pan-Asian tax authorities. The most important idea to keep in mind is that the FIRE crises that we own gold to insure against have not happened yet, that the crises themselves will produce gold price volatility that is not the signal to sell, but that the crises will force the execution of solutions that will create gold price volatility at a higher price years later. A series of crises will occur to produce the political forcing function to drive Great Shift policy changes. These crises will produce enormous volatility in all markets, including gold. The gold price volatility that occurs during the crises should not be confused with the price volatility we will see during the period of resolution when we should be selling gold, when we can expect 15% to 20% price moves intraday, such as from $2,500 to $2000, that lasts for several months. Gold is wealth FIRE insurance. The insurance premium keeps rising as more investors see and smell the “smoke” as sovereign debt defaults, the inevitable result of financial system crisis bailouts. Peak Cheap Oil added fuel to the FIRE. First come the crises, then the resolution of the crisis. The time to get out of gold is between the end of the crisis period and before the onset of resolution. Stay tuned. It’s going to be a rough few years. Eric Janszen Interviews Dr. William Black: Has the USA become a 3rd world country? Control frauds, aggressions dynamic, systems capacity problems, and the end of the world as we know it. Eric Janszen: Anyone who has heard you and watched your testimony in front of the Congress and listened to you on Bill Moyers and Fox News have got to be scratching their heads and wondering how fraud on the scale you are describing is possible in the United States of America. We think of ourselves as a lawful country. That’s one of the reasons people come here. Last edited by FRED; 05-14-10 at 06:10 PM.